We get all sorts of questions from our customers. We’ve listed the ones we receive most often. If you don’t find an answer here, feel free to contact us at 855-308-2122. Question: I’ll be using my room partition to divide a space, but can I also use push pins, tacks, and staples on the panels to display artwork or information? Question: Is my divider supposed to be making a clicking sound when I open the panels? It’s not very loud, but I’m afraid I’m going to break it. Answer: Yes, that slight click you hear is the sound of the Position Control Hinges doing their job. Think of it as hitting the sweet spot. When the hinges engage, they allow the divider to be fixed in a perfectly straight line. We hope you feel better about hearing the clicking sound now! Question: Once my order is placed, how long does it take before my room divider arrives? Answer: We make dividers to your specifications. Start to finish, you should most likely take delivery within 2-3 weeks of your order. If you need something sooner, we have a quick ship and next day option available. Just let us know, and we’ll see if we have a stock item that might fit your needs. Question: I need a really long divider. Can you custom make a 40-foot divider for me using fabric I have with my company’s colors? Answer: Although we’d love to be able to custom make dividers to each customer’s specifications, it would drive up production time and your costs. If you need a longer divider than what we make, you can use one of our Multi-Unit Connectors to join two or more dividers securely together. With 36 sizes to choose from, we’re sure our reps will be able to help you figure out which sizes to order to get you what you need. The same holds true for your fabric question. Because we want our product to be long lasting and maintain its fire rating, we use only our fabrics. We’d be happy to send you large fabric samples of any of our 38 color choices. Question: I’m into recycling and eco-friendly products. 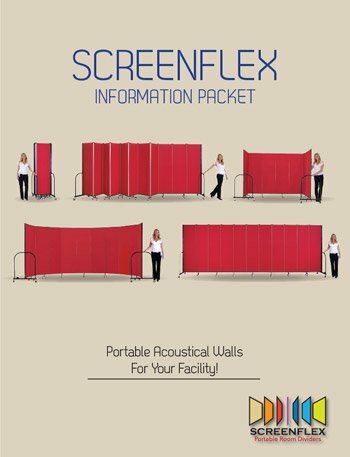 Do Screenflex Room Dividers have a small carbon footprint? Answer: Screenflex products are friendly to our environment. Our products are made from76% of recycled materials. We love being green! Question: I need to use this divider in a high-traffic area, is there a stepped-up version of your regular partitions? Answer: Yes, we’ve got that covered. Same great design, but we’ve beefed up some of the materials so they can really take a licking and keep on ticking. But actually, our standard line of dividers holds up beautifully. Our Heavy Duty Divider line is intended more for use in commercial spaces, like in hotels or convention centers. But if you’d still like to see the specs on the Screenflex Heavy Duty Divider line click here. Question: I can’t find any prices on your website. What’s up with that? Answer: We get this question a lot from people who visit our site, so you’re not alone. I’ll try my best to explain why we do this and how easy it is to receive price information quickly, and if you wish, go ahead with placing an order. We see purchasing Screenflex Room Divider much like buying a new car or even building a house. There’s a base model, but with so many options available, prices can vary depending on height and length, fabric choice, or any options selected. For many facilities this a larger budget item, so we understand how important it is to get you just the right product, so you won’t kick yourself down the road. We like to talk to our customers directly. Not so we can sell you something, but so we can assess your needs and budget, apply any discounts, and then give you a written price quote. We’ve found this ensures that you get the correct size and the best pricing too! Our non-commission consultants are available to help you M – F from 8 A.M – 5:30 P.M. CT, by phone at 855-308-2122. But if just you wish to have prices sent or emailed, just use the “Price Guide & Specials” button on our home page. You’ll receive no pressure from us! Question: I’d like to buy your product, but I’m the type of person who likes to see what I’m buying. Do you have a store I can visit? Answer: No…we have something MUCH BETTER than a store. We have an extensive list of happy customers in your area. We’ll send you a list, and you can arrange to make a visit so you can kick the tires. Question: Basically are the dividers safe to use with active kids nearby? Answer: Absolutely! At Screenflex, there’s nothing we value more than safety… not even chocolate! To answer your questions directly, it may move, but it certainly won’t tip. That’s why our engineers designed our room dividers the way they did. The steel end frame supports are specifically intended to sit low and wide on the divider. This concept lowers the divider’s center of gravity and distributes the weight nearer to the floor. This style of end support also doubles as a handle. It allows you to grasp the divider to move it, has clear sight lines when pushing the divider, and even allows you to pull the divider behind you. In addition, we use steel for our framing as well because we feel it makes for a safer sturdier divider. To create even more stability, we only use self-leveling casters on our dividers. Using this higher quality caster allows the divider to stay level if it’s on an uneven surface, or if it gets bumped. We’re not just blowing smoke when we say that Screenflex room dividers are incredibly sturdy and completely safe for use in schools, Sunday Schools, gymnasiums and child care facilities. If you’d like to see how it looks, check out this short Video. Question: I need to know if there is fire test data for your product and whether it’s for the entire divider or only the fabric? Answer: We take safety very seriously here at Screenflex. The fire test data we give is on the ENTIRE panel and not just the fabric. When comparing manufacturers, make sure you pay particular attention to fire ratings. Question: I’m trying to create a quiet testing area for students, how much sound do Screenflex Room Dividers absorb? Answer: Most, but not all. Our dividers aren’t soundproof; they are sound absorbing. Soft, porous materials will absorb Sound. So surfaces such as a Screenflex panel, which is made of a corrugated core covered by two layers of fiberglass mat and a fabric covering, help absorb a lot of sounds. If you need more convincing, here’s a link to some technical information, Noise Reduction Coefficient and a Video showing how our product absorbs sound. Question: Help! I can’t figure out a good layout, how many dividers will fit in the space and what sizes to order. Can I get planning help? By all means, yes! We have room planning experts on staff who will listen to your needs, make recommendations and based on your simple sketch, can give you detailed plans in 2D and 3D, all at no charge. Please visit our planning page to get started. We also have a quick demo Video showing what to include in your sketch. Question: My room has an 8-foot ceiling. Am I OK to order an 8-foot tall room divider? 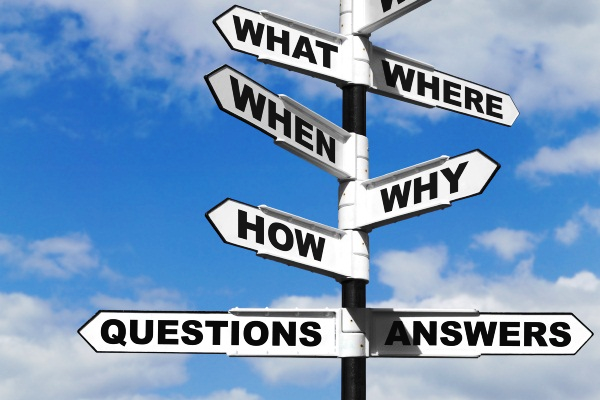 Answer: Good question, but it is not possible, and here’s why. An 8’0″ tall Screenflex standard or wall mounted divider needs more than an 8’0″ ceiling clearance. The reason is the Position Control Hinges. That’s the little circular bump located at the top of each panel; their function is to keep the divider in a straight line after you open it. These add 3/4″ in height to each divider. You’d be able to roll the divider through your doorway at an angle, but you won’t have enough clearance to upright it without damaging your ceiling. But don’t worry our design consultants will be able to recommend which heights will work in your room. Question: How can I get my Room Divider through a doorway? Answer: A standard doorway is 6’8″. Because the Position Control Hinges add 3/4″ to the height our standard Room Dividers, a doorway needs to be slightly higher than 6’8 3/4″, so the divider can fit through the opening. If you need to move a taller divider through a doorway, you can carefully angle it back and through the doorway. In this video, we show how it’s done and give the dimensions. Question: I’m having trouble understanding how to figure out the height and length, can you explain this, please? Answer: All heights are measured from the floor to the top of the divider. The caster clearance area along the entire bottom length of any divider is 5 3/4″ high. Heights range from 4’0″ to 8’0″ and lengths begin at 5’9′, going up to 24’1′. The important part to remember is that our consultants are experts in helping customers get the best fit for their space. Just give them your measurements and they’ll do the rest! Question: I have one of your wall mounted dividers and I want to find out if I can convert it to regular room divider so I can use it in different places. Answer: I wish I could tell you it’s possible, however, it’s not possible to switch a WALLmount divider to a mobile divider. However, you can switch a Standard divider to a wall mounted divider with the optional wall frame. Question: We feel very strongly about buying products that are made in the U.S. Are Screenflex units manufactured and assembled in the U.S.? Answer: We are as American as Uncle Sam and apple pie. Yes, all Screenflex products are proudly made and assembled right here in our Lake Zurich Illinois, facility. Question: How do I get a price quote and what do I do to place an order? Question: I was talking with a sales person, and they emailed me a quote, but I can’t remember what I need to do now. Fax back the order confirmation form to (847) 726-2990. E-mail the approved quote back to your consultant. Question: How long is my warranty and what does it cover? Our Screenflex products are warranted to be free from defects in material and workmanship for three years from the date you take delivery. Of course, we don’t expect any issues but make sure you’ve activated your warranty with us on our Warranty Page and you’re good to go! Question: I can’t find my shipping materials with the information on how to activate my warranty. What do I do now? Not a problem. You can register your product right on the manufacturer’s website by clicking here. If you have any questions, contact a Screenflex representative at 855-308-2122. Question: How will my room divider be shipped? We use our own proprietary packing techniques and custom shipping boxes, reducing the likelihood of damage during the time it leaves here to when it arrives at your door. We ship all our Standard and Wall Mounted Room Dividers fully assembled via common carrier in rugged corrugated boxes approved by the NMFTA (National Motor Freight Traffic Association). All Portable Classrooms ship via Inside Delivery. Inspection and Quality Control: We inspect your order right before shipping, looking for any defects or errors. Packing: All dividers are packaged securely for protection during shipping. Question: How Will My Product Be Packaged? Question: What should I do or not do when my shipment arrives? Register your product with Screenflex so that you can activate your warranty. Question: Will I need to put this together when it arrives and what tools will I need tools? Heck No! Unlike other brands, all Screenflex Room Dividers ship out fully assembled. After you remove the packaging it’s ready to use! Question: Will I know how to use these Room Dividers when I get them? The beautiful thing is that our standard Room Dividers arrive at your door fully assembled and ready to use. All you’ll need to do is unbox it and roll it to wherever you’re going to use it. If you ordered a wall mounted divider, you will need to install the mounting hardware to your wall. It’s not difficult, and to make even easier, we created a step-by-step video for you. If you’d like to view or print the instructions you can through this link standard & wall mounted Room Divider Operating Instructions. Question: How can I clean my room divider? A. Oil or grease spots respond to a mild solvent or dry cleaning agent. Just make sure you use the blotting technique. This should be enough to remove most stains. B. For general dirt spots, sponging with the foam from a room temperature solution of mild detergent or upholstery shampoo should remove it. Rinse the area with a clean sponge to remove any traces of the cleaning solution; avoid over saturating the panels. The fabric should dry very quickly. For future reference, you can print our Fabric Cleaning Instructions. Clean any dirt or stains by rubbing lightly with a mild soap, detergent or non-abrasive cleanser, using a moistened cloth, sponge or stiff nylon brush. Towel dry. How do I care for the Dry Erase Marker Board I purchased? Please Print our Markerboard Cleaning Instructions. Question: How can we get parts for our room divider? Stuff happens, and occasionally a part may need to be replaced. The good thing is that we’ve designed or room dividers so that all its parts are replaceable. Should you need one, just contact our customer service department by phone at 855-308-2122 or by email. They’ll help you decide the correct part and give you a price. Question: I didn’t order an option when I bought my divider. Can I get one now then install them myself? Yes, Installation of most options can be added to most of the Screenflex dividers. Please give us a call, and we will be happy to help. Please call 855-308-2122 or contact Screenflex Customer Service.